If I had to get rid of all my rifles and could only keep one, I’d probably have to toss a coin to decide if I was going to keep the D48 or the D460. Both are .22s and both have been tuned by John in Pa. If I had to get rid of all my rifles and could only keep one, I'd probably have to toss a coin to decide if I was going to keep the D48 or the D460. Both are .22s and both have been tuned by John in Pa.
Yep that would be my RAW TM1000, hands down the best I’ve ever owned. Yep that would be my RAW TM1000, hands down the best I've ever owned. PCP hands down my WARP COBRA! have both barrels for it and I love to carry it in a side holster while hunting for the really close shots. Would have to be my .25 wildcat in a rifle and my Ataman AP16 in a pistol This is one of the first batch of wildcats and it been a pleasure to shoot and maintain have both barrels for it and I love to carry it in a side holster while hunting for the really close shots. My Steyr Hunting 5 Auto Scout with Gary Cane custom stock and March 3-24. I have several that I am very fond of but will never part with my first pcp. After having it tuned, regulated, new barrel, and stock (made by me), there is none like it. It is a tack driver at 50 yards and I took 22nd place at EBR in 2016 with it in the 25 meter. I am sure there are better rifles out there but we have been through a lot together. It’s my .22 Marauder. I would never part with my .22 Falcon pistol either but making the stock myself puts it on top! The one I will never part with is a FWB 300, it’s just a hoot so shoot. That said, my 22 Marauder tuned and upgraded by Travis is always near by for posting duty: it is a pleasure to use, but , the FWB 300 is more “fun”, if that makes any sense to you. 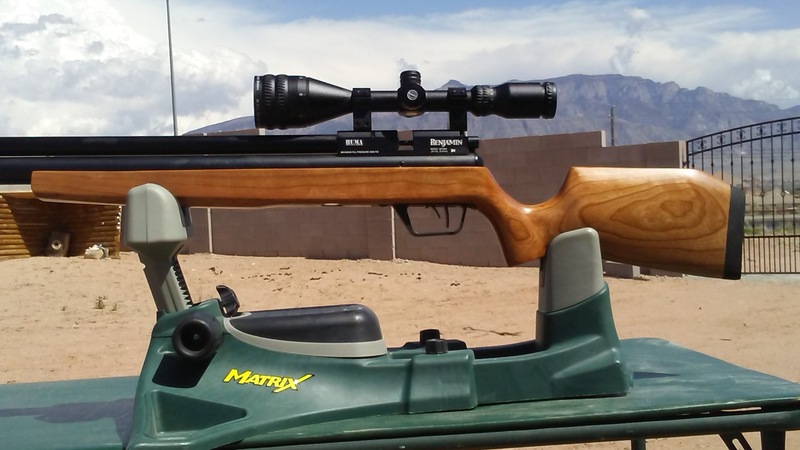 Ten years ago I would have said my Beeman R-7 (with a Beeman 2-7 Scope), which I purchased at the Beeman shop in Santa Rosa off the rack, would have been my favorite air rifle. I am drawn to springers. Since then, however, I would have to say my Walther LG55, with a Tyrolean stock is now my first choice.. I removed the three pound internal lead weight and the target sights. I had to replace the spring, and then mounted it with a 3 to 12 power scope. The trigger is very fine. It now weighs in at about 61/2 pounds, and is a delight to shoot, and is far more accurate than I am! Antique-BSA/Lincoln Jeffries under-lever in .22(over 100 years old). It will shoot a CP at 500 fps leather seals and all. No way I could have just one so I settled for one favorite in different categories. CO2-Heavily modified Crosman 2240 in .22 Captain America theme Springer-Beeman R9 in .22 PCP-RAW 1000X HM in .25 Big bore-Airforce Texan in .457 Custom-Mac 1 LD pistol with 14" barrel in .22 Vintage-Crosman 600 CO2 repeater pistol in .22(early addition made in early 60s) Antique-BSA/Lincoln Jeffries under-lever in .22(over 100 years old). It will shoot a CP at 500 fps leather seals and all. No way I could have just one so I settled for one favorite in different categories. I have many more expensive rifles, but mine is my BSA Supersport mk2 .22 with a williams FP-AG rear sight. It makes me smile every time I shoot it. Hmm, really tough one… Since I now own a compressor and air is limitless, I’d have to say my FX Boss. The 30 cal is just a great caliber IMO, and 45 shots per fill on such a (relatively) powerful gun is great. I’ve got the trigger adjusted perfectly and the gun shoots lights out. The heavier pellets buck the wind better for long range shooting, and still don’t break the bank too badly to shoot regularly. Mine is topped with a Hawke Sidewinder ED 10-50×60 and FX no limit rings, which is a great combination. Now, since I don’t have to worry about air, I’ll probably shoot this gun all summer. Closely behind it I’d have to give it to my Kalibrgun Cricket in .25. Can’t beat 100 shots per fill when charged to 300bar, plus 52 ft lbs of energy! Hmm, really tough one... Since I now own a compressor and air is limitless, I'd have to say my FX Boss. The 30 cal is just a great caliber IMO, and 45 shots per fill on such a (relatively) powerful gun is great. I've got the trigger adjusted perfectly and the gun shoots lights out. The heavier pellets buck the wind better for long range shooting, and still don't break the bank too badly to shoot regularly. Mine is topped with a Hawke Sidewinder ED 10-50x60 and FX no limit rings, which is a great combination. Now, since I don't have to worry about air, I'll probably shoot this gun all summer. Closely behind it I'd have to give it to my Kalibrgun Cricket in .25. Can't beat 100 shots per fill when charged to 300bar, plus 52 ft lbs of energy! Out of the many air rifles I own and the numerous I have had the opportunity to shoot, my favorite is my .22 FX Independence. Super smooth, surreal quite and crazy accurate; all in one package. Out of the many I’ve had my current FX Streamline in .22 is my favorite. Out of the many I've had my current FX Streamline in .22 is my favorite. but ….. in another month or so that could change , maybe Daystate Pulsar or the FX Imapct . Hmmmm..... this one is hard .Evanix monster was my first one. Loved the amount of shots that I could get . My .177 was extremely accurate .Liked it sooo much I purchsed 2.Now my favorite is .......FX Wildcat but ..... in another month or so that could change , maybe Daystate Pulsar or the FX Imapct .